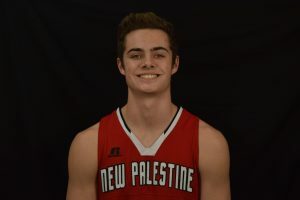 The New Palestine boys basketball team used a strong outside shooting game Friday to beat Delta 63-48 in a Hoosier Heritage Conference matchup. The Dragons hit 12 3-pointers, including five in a 23-point second quarter that saw the Dragons take a 30-24 halftime lead. The Dragons pushed the lead to double-digits in the third quarter and led 46-36 after three. The Dragons are now 5-5 on the season and 2-1 in HHC play. Delta, which entered the night with an eight-game winning streak, is now 8-2 overall and 1-1 in the HHC. Senior Gavin Hausz had a big second quarter, hitting two 3-pointers and scoring 10 of his team-high 18 points. On the night, Hausz drilled four 3-pointers, two second-quarter two-point shots and was 2-for-2 from the line. Sophomore Maximus Gizzi hit his second 3-pointer of the game in the second-quarter barrage en route to a 16-point night. Delta cut what had been an 11-point NP lead to 54-48 with three minutes left, but Gizzi scored a basket and the Dragons hit 7-of-8 from the line to score the game’s final nine. Gizzi was 4-of-6 from the line in the fourth quarter and added two baskets to score eight points in the frame. Hausz and Dylan Romine were both 2-for-2 from the line in the closing minutes. Kyle King also had a big basket early in the quarter and finished with three points. Romine finished the night with nine points, as he hit a second-quarter 3-pointer and four second-half free throws. Matthew True hit three 3-pointers for nine points. Dawson Eastes finished with eight points, with a second-quarter 3-pointer and five third-quarter points. Eleven of the Dragons’ 15 field goals in the first three quarters came from distance – with Hausz’s two second-quarter hoops, a second-quarter basket from Romine and a third-quarter shot from Eastes the only ones from inside the arc. Delta was led by HHC scoring leader Josh Bryan, who scored 27 points. The Dragons return to action Saturday night at Hauser. The Dragon JV won 54-49, while the NP freshmen beat Delta 28-18. Senior Gavin Hausz hit four 3-pointers en route to an 18-point night. 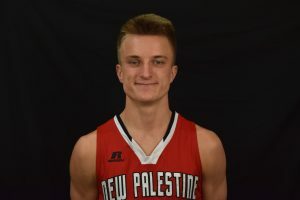 Sophomore Maximus Gizzi scored 16 points in the Dragons’ victory.